In October 2015, Dr. Michael Ben-Eli was invited to present Bren Smith of Greenwave with the 2015 Buckminster Fuller Challenge Prize. 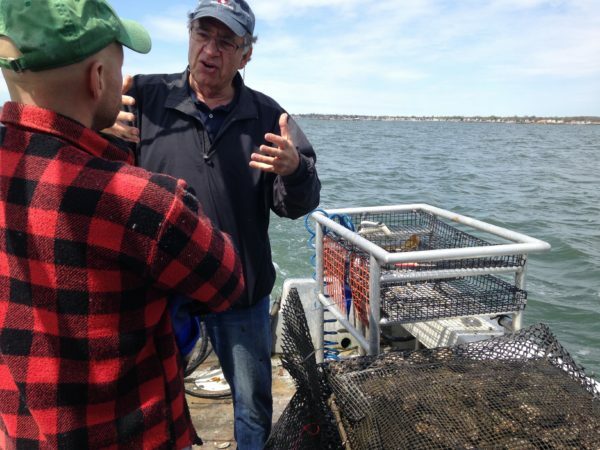 The non-profit has designed the world’s first multi-species 3D ocean farms, aiming to restore ocean ecosystems and create jobs in coastal communities by transforming fishers into restorative ocean farmers. “GreenWave exemplifies beautifully Fuller’s inspirational call for individuals and groups to take the initiative, identify a critical issue, and tackle it independently, creatively, responsibly, and in a comprehensive manner,” said Dr. Ben-Eli at the award ceremony. 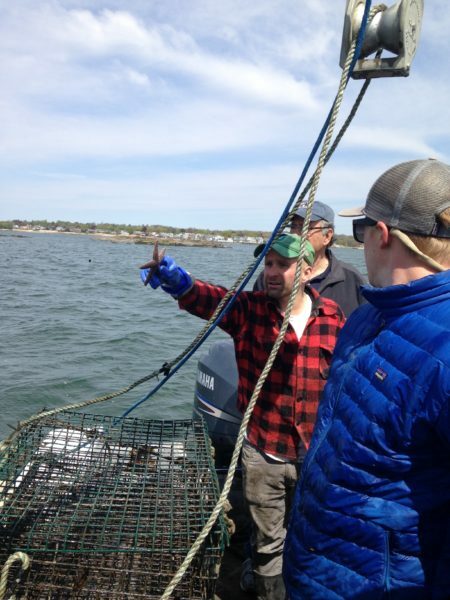 Last week, we had a chance to visit the underwater farm with Bren, and team member Asa Dickerson, on a wonderful morning at sea just off the coast of Branford, Connecticut. We watched as they pulled lines of long, beautiful kelp–cheap and easy to farm, with a negative carbon footprint due to its ability to sequester carbon–out of the ocean. Greenwave believes that every ocean ecosystem around the world has an abundance of sea vegetables waiting to be discovered, farmed and harvested, to feed the world and turn fishermen into ocean farmers, while protecting the seas and mitigating climate change. In addition to the kelp, we tasted oysters and wild clams fresh out of the water. Wow! The farms also act as natural reef systems, and are now teeming with life–a fact we saw firsthand when they pulled the oyster cages from the water and found crab and starfish hanging on their edges. These “reefs” will also protect coastal communities from violent storms, enhancing resilience to climate-related weather events. Greenwave is a project that embodies not just Buckminster Fuller’s legacy, but also The Lab’s Sustainability Principles. We look forward to hearing more about how the project develops. For more information about Greenwave, click here.